Drury Stone Chapel in the heart of Springfield, Missouri is located in the midst of beautiful, mature trees. At sunset, these trees glow. You probably wouldn't believe me if I told you that on the morning of this wedding, the wind was blowing 30 miles per hour and the temperature was 40 degrees. By the time we stepped out for portraits of the bride and groom, the wind was gone and the sun was screaming at us to take portraits in it. This is the lighting that everyone describes as the Golden Hour. 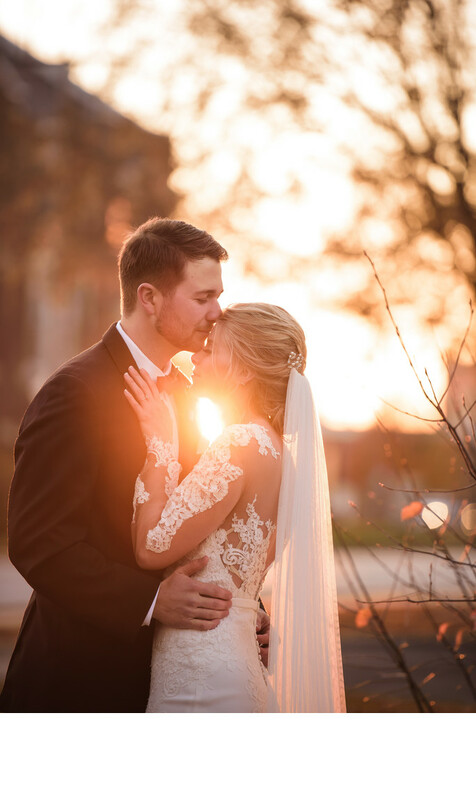 This bride had a custom wedding gown from Provovias in Chicago, Illinois. The Vincenta wedding dress was form fitting with large sections of lace from top to bottom. She had the sleeves custom made back in Springfield which completed this classic gown. Her french silk wedding veil glimmered in the sun. The connection between this bride and groom is completely sincere. Yes, they were freezing. Yes, they were cuddling for warmth. However, they did not mind one bit that they were freezing on this November day. They were so thrilled to have just gotten married only a few minutes before. I told them to take a few minutes and ignore that I was present. I wanted them to cuddle and reminisce on the beautiful wedding day they created. Location: Stone Chapel, E Central St, Springfield, MO 65802.